I'll start: "When you said boat ride, I thought you meant . . ."
Our love is all washed up. Love those captions, Mary. I especially love Swan Lake. Laughing on the lake of love. Love and laughter, the key to a happily ever after. I listened to the song link you gave me last week. Beautiful song. Let's fly away, on the wings of love. Your love can lift me higher. Love both of those captions, Sherry. Nicely done. This image made me laugh and I had to use it for WW. Congrats, Rita! I missed out last week because I was in California seeing the THOR people! This makes me think of The Little Mermaid....Go on and kiss the girl. My fave scene in the whole movie!! Yes, I see what you mean. Perfect caption. I LOVED your post about seeing the THOR people. What a fabulous experience. And . . . Tom. Need I say more? I fell in love with him while watching The Night Manager. I love The Night Manager! Our love is moving along smoothly. You said you were taking me on the ride of my life but this is kind of boring. You're welcome, Rita. Very clever caption last week. Great ones this week too! You're on a roll! How soon until we reach the tunnel of love? LOVE the tunnel of love caption, BN. So creative. Just you and me and the sea of love. Oooooo, I love that caption, Laura. As I read each caption, it's getting harder and harder to choose a winner. It's gonna be tough! By the light of the silvery...moon, I said MOON! No problem, Karen. Thanks for coming back and leaving your email. Much appreciated. I love your caption. Such a great song. The swans at the zoo just chased us, are we safe? 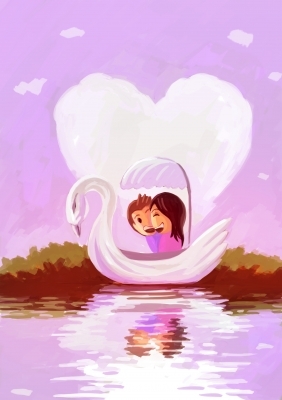 Love being stuck in a swan boat with you. Love means laughing with your best friend. It totally looks as though they are laughing, maybe because they have to get on a swan boat. I'd laugh too. I love, "Love means laughing with your best friend." Such a sweet caption, Tabitha.